Now this is more about where to start and what to learn. If you want to make very specifically an MMO there is a huuuuuge amount of stuff to learn and depending what your skillsets and interests are, the starting Point should be chosen accordingly. I think one starting point would be, to do what you already know and build up on that, like if you are an artists, start with drawing concepts or game mockups (fake screenshots), characters etc. If you are a programmer, you could figure out, if you want to use a specific language (though the best would be to stick what you feel comfortable with, since every language has it’s up and down sides). If you are a writer or like to write stories, start with that. Another starting point could be to start what interests you, no matter if you have skills for it or not. Interest in a topic/ curiosity is a really big motivator and helps alot against walls you will encounter. As example, I’m really interested in free modifyable terrains, like Voxel Terrains, because I think, they allow for such a freedom and “realism” in landscapes that Heightmaps just can’t do. 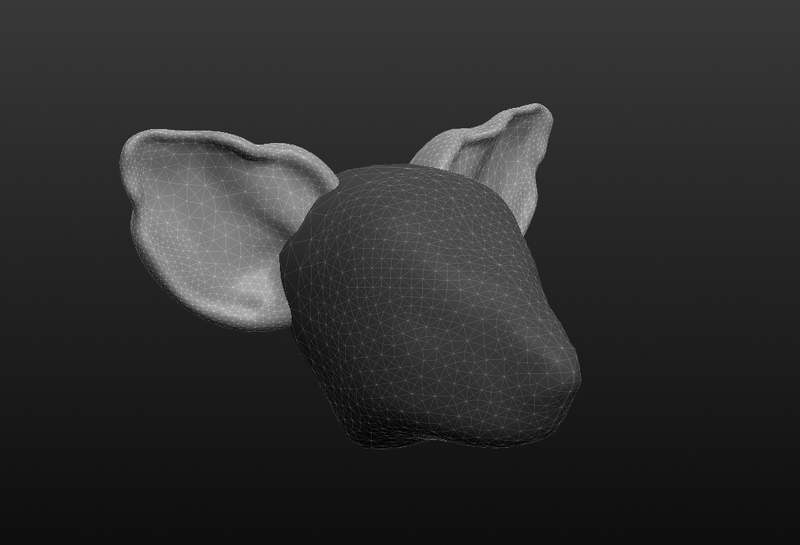 Also I think that so far no voxel solution has exactly what I need, so I want to do it myself. I’m starting by learning how to create 1 voxel on the screen and then go on to apply a texture to that etc. If you need to reduce the options, try to figure out if there are things that you are not interested into at all or what you really don’t like to do. If you are interested into having results as fast as possible, you could look for Game Development Kits (game engines like unity), pre-made assets, prototyping, MMO specialized developing kits, working through a full game tutorial, Networking for unity etc. As far as I know, there is tons of material out there to get a visible game on screen relatively fast (unreal even has a non-programming node system, which you can create game logic with). It won’t be pretty and it most likely won’t be very impressive or looking like any MMO you know, but it’s a start. It will not be World of Warcraft, it also will not be Ultima online or any big fancy names out there. Not NOW! It will not even be close to that in the beginning. Any MMO starts small and it’s easy to underestimate the amount of work that needs to be put into it, to even create the smallest and tiniest functionalities that you got used to from modern MMOs or games in general. One of the reasons why probably alot will say to not even consider starting an MMO is because you have to fill all the roles, from sound to music to programming to art etc. and each of these roles have a big load of work to do, for every asset and functionality you want to have ingame, you need proper responses and interaction possibilities for the player. Just as an example: If you want the player to move per rightclick to a spot you point on the ground, you will need to code how the cursor position on the screen (2D) translates into a 3D coordinate on the ground, it needs to recognize where the ground is. Then you probably also want some kind of feedback for the player, like a cross on the ground, you have to make the graphic for that and then display it on the ground and it needs to delete itself and reappear whenever you click on the ground or reach the target. Then you also need the character to move, so you need to transform it’s position and ideally it also has Animations that are following the direction of where you are going AND your camera should be following your character, always pointing towards the character or being moved by the player. Then you also want footstep sounds as a feedback for the player and most likely you also want not just a cube but a proper 3d model, with textures! and maybe even character customization? so you need a model for EVERY variety of your character and test every possible combination etc. It’s really easy to go out of hand and also really easy to loose out of sight what you actually wanted to try out. -recognize that mouse is on inventory(programming) etc. I think you get the point, it is very important to learn how to make tasks so small that it becomes clear what you need to do and it will also give you an image of how much you need to do. Simplificated: As long as you are not sure, what skills are needed to achieve something, the task is not small enough. When you can not determine even roughly how long it will take you, the task is most likely not small enough. If you can not tell where to start, it’s most likely not small enough. When someone asks “how to make an MMO” they most likely did not look deep enough in what an MMO is build of. And there are alot of layers…. So keep in mind, if you want to make an MMO, it won’t be beautiful, it won’t be nice, it might not work very well, it might not be online at first, it might not look like much, but if you spend alot of time on it and improve it as you learn and not give up on it, it will eventually be a real and living MMO, that is being played by someone. A little heads up: this is my personal opinion and it’s based on my personal experience that I have so far with being a complete newbie game developer, on how to attempt an mmorpg as a newbie and solo-dev. I will start on how I started thinking about even making games. So in my life, I wanted to become an artist, most of the time, people were supporting me more or less for it. I got to meet other artists and I tried to be accepted on universities and special schools for art related stuff. All the while I was gaming away at home. Thanks to my dad and uncle I was even able to experience the C64 despite my young age and thanks to my dad I got a huge interest in computers and everything electronic. My dad was also a hobbyist programmer, making his own lottery programs to try to predict number outcomes and he made a program for his workplace machines, which was then being used for the whole company(even though programming wasn’t part of his job). Moving on, my brother got similar interest in games and computers and because of neglecting homework and school, he was being asked, why he isn’t turning his love with games into work, also since he was good with math. This got stuck in my mind, wondering, why I wasn’t asked the same thing and that it most likely was because I’m a girl and not really good at math, thats atleast what I thought or was made to believe. So going for the artistic direction, which seemed to be more accepted and I didn’t need to worry about math, was the logical choice for me and also alot of fun, at first. But soon after I started at a school that was supposed to be more illustrative based, they changed the school system to be more “job-related” and the only thing they could think of, was advertisement. It felt like it was breaking me. Sure I didn’t mind learning Photoshop in this time and learning how to operate another Operation System besides Windows, but I wasn’t very happy with it, that suddenly I was being told what to draw and HOW to draw. Suddenly whatever drawing I did it was never good enough. My style either too childish/comic-like or I was not making enough sketches before drawing the finished project. And I’m not talking about making 1-3 sketches, before settling on something…no…I was expected to do 20 sketches, that I can’t just decide to take an early sketch I like. It seemed “weird” that I was having an idea in my head, which I just tried to bring on paper, instead of having to find an idea. Needless to mention, this caused me to question whatever idea I have in my head or whatever I already started drawing, that I could have done always a better idea, that there always is a better way to solve it, which then concludes to not finishing anything. This was taking all the fun out of drawing for me, so for a long time I didn’t really progress like before and I felt cheated for years, but atleast I was certain at this point that I don’t want to do advertisements for the sake of advertisements! Yes, this was also the time I started with MMOs and interestingly enough, my first one wasn’t Ultima online, but an Asian MMO called r.o.s.e online. Actually, this is also where my affinity for sandbox games came from, since alot of those 2D stylized asian MMOs were heavily social and freedom based, so housing and skill based system was “normal”. Back to looking for universities: In short, I was literally being told that my art is too symbolic and figurative and not refined enough. Meaning I was drawing too much actual humans, animals, angels etc. instead of experimenting with colors and shapes (yeah right…) so I was not accepted. And I was baffled because I thought Art Universities would be about learning drawing in general, not to learn a specific kind of drawing, which also led me to believe that ALL Art Universities must be like this (in germany). So I tried figuring out, what kind of Art I like to do and where I could find it in Internet, looking for examples of sketchy figurative work and maybe also something that I could combine with my love for games, so I found out about concept artists and character artists. so I had set my goal to become that, because figurative and symbolic was WANTED and needed in this kind of Art or rather Design. Also I had experimented with some 3D games, playing around with their editors to see how I can change things, but nothing really serious came out of it, mostly because I always had that nagging thought, that this is not mine, whatever I build, it’s on top of some other persons game. I met a man, who is a fantasy book author and since I lvoed everything fantasy and he seemed to be interested into games also, I fell for him, for around 7 years. It was in that time, that I thought he could help me gain confidence in myself and reach my goal of becoming a concept artist or anything I would want to. Sadly, those were lies. And even though I got to an University study, that was oriented towards Animation and Games, I couldn’t invest myself into it properly, because of the stress I experienced every day at home. I somehow managed though, to learn a few things and to make some games with university groups, which were really making me more confident in myself, since I learned so much on what my strengths are by working in a group and also where my weaknesses are. Also, doing those studies and getting a free choice on what to study for each hour spend at university, was making it more clear where my interests are laying and where not. As example I have a huge interest in everything electronic still and I had alot of fun trying to program a small RC cart to work with a wii nunchuck 🙂 I had alot of fun switching roles in teams alot, from working on code, drawing, animations, 3d modelling and overall Design. In overall I loved making composition for games and helping others realize that it doesn’t need an artist to be creative and that whatever idea one has, it can be used to make a game from it, no matter how silly or stupid one thinks it might be. So after crashing really hardly with my past partner, who seemed so promising, because he not only promised to fix my personality “issues”, but also, he was saying that he is a veteran programmer and that he would be interested in making games with me, he even went as far as making a company in whos name I could work and make my internship in. I worked really hard on collecting all the necessary knowledge to create a character creator for our “mmo” project, everything that I could do without needing programming. I made a working prototype which supported different body shapes, gender, hairstyles, basic face shapes, all smoothly transitioning within 3dsmax. I also started a smaller game idea of mine, for ipad, that used the gyroscope inside of it to play it and as the main game element. I had the character model ready and I was even creating a working prototype inside UDK, WITHOUT any programming. Sadly after many promises of helping me with programming he never did a single line of code and in many other aspects I figured out that he is only abusing me and talking down the achievements I had made by putting it all on his plate. If you want to be a programmer, start programming. If you want to be an artists, start drawing. If you want to be a game developer, start developing games. You don’t know where to start? Start where you feel drawn to, start what is interesting you, start what you want to have. Because only that will eventually involve us deep enough into the subject, that we will also become willing to do the necessary hard work for it. If you want to make an MMO, then go ahead and start doing it! From all I have learned, is that no one will do YOUR dream, everyone follows their own dreams and while some dreams seem to work nicely together, some are clashing really hard. Like in my case. As long as I was believing that someone else could be the only chance for me to make my dream come true, I was not doing it myself and the moment our paths were split, I lost alot of my hard work that I had put into it. You can not change other people, you can only change yourself and how you interact with the world. Also, quality is an illusion. When it comes to drawing as example, the moment an idea is successfully communicated, it worked! The moment a program is running, it works! What we define as good or bad, is how “flawless” something seems to be, how “perfect” it is and that has no reasonable definition. It is open to the top. You can always improve yourself, there is no limit to that. So WHY should you bother yourself with what someone else did? Your skills/quality WILL improve with time, the longer you are doing it, there is no way around it and there is no way you would suddenly loose progress or not progress at all, even if you take a break, you won’t loose it! Your body might need to remember after a longer drawing break, how to use the pencil, but it only takes a few warm up sketches to get back to it. Or programming, of course you can always improve your code, to look better organized or to make it work faster, use less memory etc. But you don’t need to do it right now, when you just start out learning how to do things! You don’t need to know how the professionals are doing it. You don’t need to make that PERFECT MMO, if you wanna make an MMO. All you need to make your dream come true, no matter what it is, is to not give up on it. Work on it, dream about your dream, live your life. You can not predict the future and it’s not possible to tell anyone what exactly you need to do, to reach your goal. Some people start out as a carpenter, work for 50 years in it, before they turn towards game industry and become an Indie developer. If you wanna change your life, start changing it, but do not make the mistake of changing yourself how others think you should change yourself, do what feels right to YOU, do what YOU think you need to do, what you love to do. It’s not always easy and I can tell you that quite often I bash myself for not doing enough or for thinking that I’m just blabbering empty stuff and how it seems I have nothing to show for all the work I have done already towards my goal and dream. And sometimes I’m thinking it’s bad that my dream seems to change quite alot also…I don’t have a fixed dream of becoming a game developer, you could say I have a vague direction, that I know I want to go and where I don’t want to go. But no matter what, as long as I stay true to myself and follow MY path, make my own choices and decisions, I will be able to stand up for them! I will be able to stand up for myself and be confident in myself, because it’s lasting, because it won’t just vanish, my experiences will stay with me all my life and every step I do towards learning how to be true to myself, I feel less helpless and depending on others. Which then allows me to allow others into my life and work also. The moment you decide what you want to do and know that it is truly YOU wanting it (emphasize YOU not the want), then no matters what others might say, they won’t make you budge. They won’t be able to talk you out of it anymore. Specifically if you know that those who usually scream loudest: “Dreamer!” “get realistic!” etc. are usually the ones who have not allowed themselves to dream anymore, it’s those who gave up probably a long time ago and they can not allow anyone else to get what they couldn’t get. They are griefing and they have no clue that they do, so it turns into hatred, mean comments and trying to bash others down, the same they felt what happened to them. Don’t take it out on them, it’s not their fault. We live in a world where everyone is raised like that and it’s only a few who (even though increasingly more) who break out of that and live their own lifes. Yeah, the truth can be quite cheesy and hopefully somebody out there will read it and not needing to spend years to figure this out. While I was contemplating, why I have not started my actual MMO game yet, like actually started, like having something visible on the screen of a game that can be roughly recognized as something that can shape into an MMO. I noticed thoughts of that I don’t think my idea is spectacularly special or overwhelmingly unique or that it would somehow be different enough from other games to not just get the stamp of: URGH another MMO like that! But why should it matter to me? Why should it matter to me, if someone thinks my game idea is not worth exploring? why should it matter to me, if my game is getting popular or makes good amount of money or not? Does it make me less of a true game developer to have thoughts of wanting it to be profitable? Is it making my idea less worth, if I think it might not be THAT big breakthrough? But there is also another thought…WHEN is the start of a game? When is it “born”? Who is making the treshhold of when a game is starting to become real? and are other indie game devs having similar thoughts and insecurities? You can do, whatever you want to do, there is no “best skillset”. If we do, what we want and need, if we follow our dreams, then the skills we already have will be forming a new Skill that is very unique and special in every way. That is atleast, what I believe in, since creativity works the same way for me. I collect and I combine and when I bring it down to paper, no matter how often other people have drawn dragons, my dragons are unique, no one has drawn anything like them, that goes for everything and everyone. Our skills, our styles, our way of being is a collection of everything we are and what we have done and experienced in our lifes, it doesn’t exclude anything, even if we put more importance into some events than others. Life doesn’t care about our values…heck even our skills don’t care about our human values. If we understand and accept this, then we will realize that we can do anything! To be honest, those thoughts came up, when I was again confronted with it, that for years I was holding myself back in regards of programming…I was asked how I’m supposed to learn programming, if I’m having bad grades in math…I was being told in subtle ways, that women are not good at math and programming, that women have more problems with finding solutions, that women are not good with logic and that the closest I can get to making game worlds is Art. I was confronted with it, that as children me and my brother were both playing alot of computer games (which was already seen as awful, because we did it quite excessively), but it was only my brother who was being asked why he isn’t turning his love for computer games into something useful like programming….when I was applying to study for Games and Animations, the topic with my math grades came up….when we were having programming lessons in university, the starting point seemed to be further than “beginner” which resulted in me feeling again discouraged and believing that I’m just no good at programming…. achievement unlocked: ridiculify your negative thoughts! 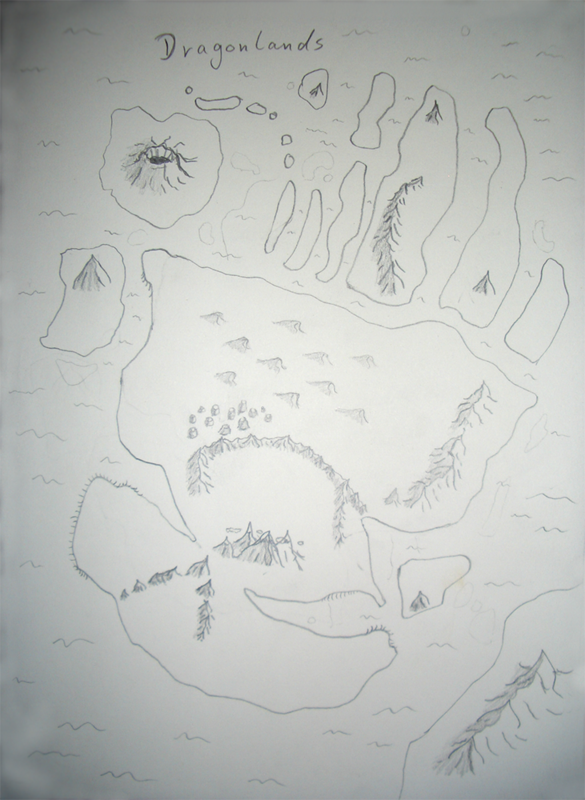 So now I have done it, I have overcome the first empty page of my sketchbook that is specifically only for Dragonlands related stuff 🙂 and I think I can also call it a first attempt at handdrawing a map.